There were four of us did the Ridgeway. Stuart, Nick, Polly and myself along with Simon the Telly on the first day. Now a few days before we started Polly tore a claw out, skylarking in the woods, and was put on R&R so missed the first day. Gutted? We all were apart from Simon who stepped in to take her place. No worries she joined us for the second day and was fine throughout. She wasn’t going to get off lightly though. As for poor old Stewpot, his foot gave out on the march into Ogbourne St George. Leaving him behind on the last day was truly very sad but he did meet us at Avebury. Both wrongs therefore needed to be put right. One sunny Sunday last year Stuart called to see if I fancied a walk over to the Plough at Cadsden, end of our first days Ridgeway walk, for a pint. When we got there at the end of that first day a pint would have been most welcome but sadly it was shut. Perfect thought I. We’ll take Polly and that’s a bit of the first day done and we can have that pint. No hardship. In fairness Polly has done a lot of local Ridgeway both up to Coombe Hill and over to Godders in Tring so for the best part she was on home turf. We met in the High Street at four and set off up Coombe Hill. It was a pretty straightforward walk of about four and a half miles. Once on the hill Polly was in her element. Ignored the sheep as instructed and spent the time back in Ridgeway mode. The sky was blue and it was warm. Past the monument to the Boer War, which I once climbed on a windy night for some reason, just to say I was higher than the official highest point on The Chilterns, which is actually another Coombe Hill at Halton! From there we meandered down through the woods to Chequers, whose land you cross on a public footpath, watched intensely I’m sure, and then up and down past Pulpit Hill where there’s a supposedly a near perfect, well hidden, hillfort that we ought to visit next time out. Then across Grangelands, passing our favourite sign pointing out that Wolverton is 35 miles that way, Velvet Lawns and into Happy Valley. Here you drop down onto the road and it is but a short walk to The Plough, which was amazingly but unsurprisingly shut! Never mind, Stuart got his phone out to summon taxi Jane to come and get us. No signal. We knocked on the door. “Please could we use your phone?” “Not a problem, sorry but we close at two on Sundays.” I called the home number. Engaged. Tried several times but engaged. Tried the mobile again, no answer. Should have brought a carrier pigeon. We looked at each other. Nothing for it, we’d just have to walk back. By the time we reached the Swan it was dark. “That went well then.” said Paul, the tallest man in Wendover, as Polly sorted out her spot on the settle. Suitably refreshed we decided that we’d give it another go just to say we’d walked to the Plough and got a pint. 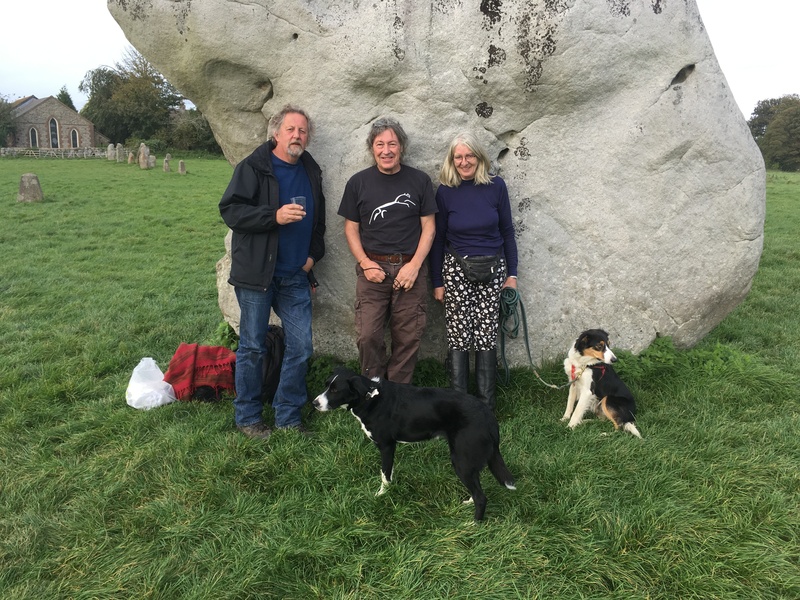 Indeed a few weeks later the three of us, and an eager dog, set out for The Lions at Bledlow, scene of the exploding rabbit incident, with a planned lunch stop at the Plough. It was closed. 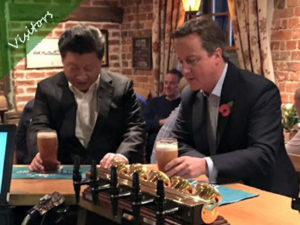 Clearly the Chinese that now own it, on account of that is where their President went for a drink last time they visited Chequers, haven’t got a clue about running a pub. We had checked before we set off and were told they would be open. Now the bloke that does their website drinks in the Swan so we’d have a word. Autumn drew in and Polly still had to do the Ivinghoe to Wendover bit. We saw a slot, probably the last for a while, and went for it. Polly seemed ecstatic. Last time she was there it was to wave goodbye. There are two ways to reach the Beacon if you are dropped off by road. One is to climb the nearly vertical face from the Dunstable Road, the other more favoured option is to walk the half a mile the wrong way down the Ridgeway, salute the stone and walk back again. That was the option we chose. Actually it was nice to be able to see something this time round. No damp cold clinging fog. The walk back was just lovely, the sun broke in and out and there was a slight chill but we soon warmed up but, being a weekend, the coffee van was closed at Tring Station so we elected to go a bit off piste and visit the Greyhound at Wiggington, a well good pub that, although does posh foot and isn’t the cheapest in the area, is still a pub and, more importantly, welcomes dogs. A couple of pints later and a treat or two from the jar on the bar for Polly and we set out for home. I love this bit of the Ridgeway as it parallels the old boundary known locally as Grims Ditch which is rather impressive in places. Unfortunately HS2 will take out the most intact bit close to where it crosses the Wendover to Missenden road. 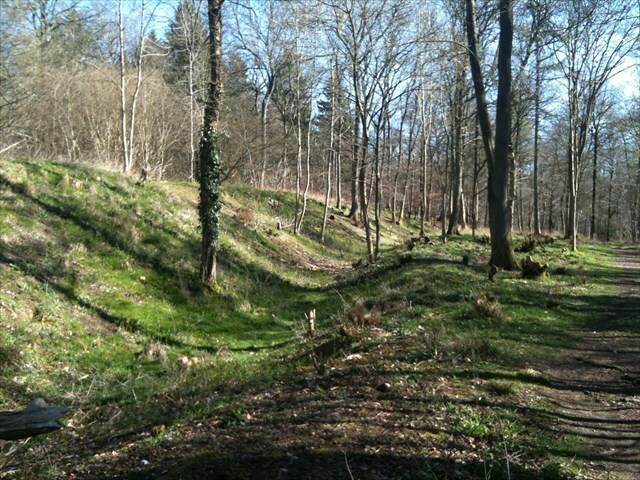 You meet Grims Ditch at Pitsone Hill, a couple of miles from the Beacon and can follow it as far as Wendover. 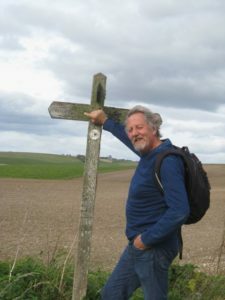 We sometimes use the Ridgeway to walk to Nick’s from the village so we have trod it often, usually to discover Nick is out walking the other way! Sadly for us Godfrey was away climbing K-2 or something similar so no stopping there for a pint of his home-brew Wherry but now Polly was on familiar ground and got busy chasing squirrels. At the top of the sunken lane that leads steeply down to his house we stopped for a celebratory. It was late afternoon and so we took a company decision and detoured for a cup of coffee at the Café in the Woods before taking the route down to the village past Boddington Camp a well hidden Iron Age Hillfort that was quite spooky in the mist when we were kids. Still is. These were the days before the hill was a visitor centre. It was properly forested, managed woodland, planted with pine trees. 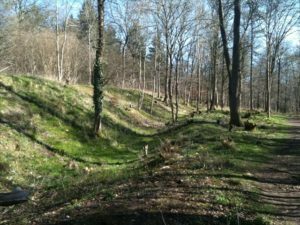 When the trees were originally planted the spoil left over from digging the holes was left by the side. Over the years these mounds washed out leaving piles of flints. If it was a damp morning then as the sun filtered through and warmed the flints small pillars of steam would rise from them. That was enough for us, aged seven, we were off out of there! There was also, still is, a circular concrete covered reservoir in the middle of it. That is also a tad weird and even today we don’t go near it, not even Polly. Most of the pines inside the hillfort have now gone and it is now the domain of the beech. Down into the village we went, dutifully following the Ridgeway proper to ensure we ended up in the Swan. “That went better,” smiled Paul TMIW, “ESB and a Pride?” Polly was horizontal, eyes closed dreaming of muntjac chases and squirrels. It was a fair while before we tackled the last section from Ogbourne to Avebury. By now Godfrey was in plaster, the result of throwing a dog lead at his missus’s dog and ripping the tendons in his shoulder. We felt he would just be a burden so we invited Jane and Roxy. Eventually we convinced her it was only eight miles and she reluctantly agreed to join us. Barry kindly offered to drop us off and meet us at Avebury with food and fizzy. We chose a very nice day but unfortunately it was a Saturday so a quiet Avebury we did not expect. Duly dropped as close to the point where Stuart had left the Ridgeway to limp down into Ogbourne we climbed up and around the village. Third time that had happened! 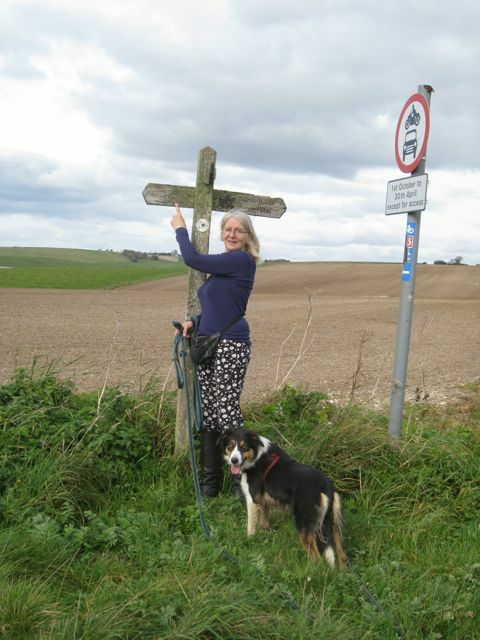 Polly knew the way by heart but soon enough we swung left and climbed back up and onto the Ridgeway proper. Although the Ridgeway is claimed to be the oldest road in Europe it is really made up of many old trackways and drover’s routes hence the profusion of hillforts along its route. Its present form though dates from the Enclosure Acts of 1750-1800 that defined its route and width, 40 feet mostly, with banks and planted thorn hedgerows to keep the livestock from wandering into the cultivated fields. A lot of the hedgerows have been replaced by stock fencing though, especially on the more exposed parts but the western end still exhudes ancientness and is little changed in either route or form from prehistoric times. Stone Age sites rub shoulders with the Bronze and Iron Age. It beckons you on and before you know it you are engulfed by Barbury Castle then and spat out the other side. Barbury is after the Saxon chief Bera who gave the Romano British a kicking in the mid sixth century and started the Anglo-Saxon period, We stopped to take in the views, sadly no flapjacks for Polly this time and there was an interlude when Roxy went AWOL but fortunately we caught her before she got chased by the farmer and the cattle roaming the upland we were crossing. 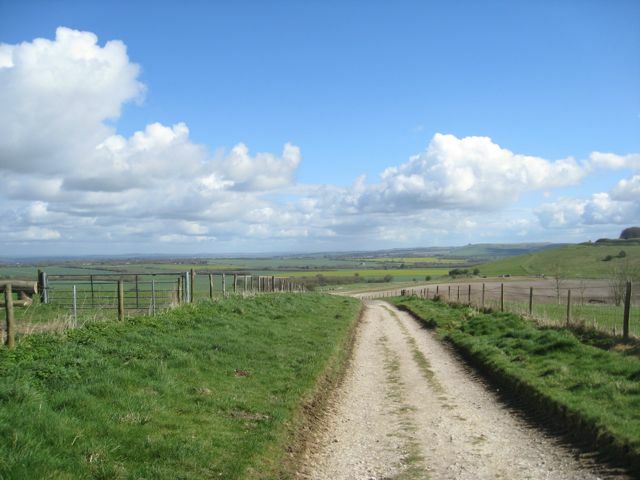 Then its the Ridgeway you see in pictures. Deeply rutted with abandoned erratic Sarsens dotted about. It was quite busy but it was still full of magic, in the distance, smoke from a bonfire or two marked where Avebury was, a sight that wouldn’t have been unfamiliar in the late Neolithic when it was established around 3000BC. Stuart smiled a happy smile and we stopped for the customary piccie or two before dropping down and through the banks flanked by the huge weathered Sarsens. Even on a short walk there is still a feeling of marvel when you walk into Avebury. We called Barry who had spent the day taking time-lapse pics of the clouds and landscape, reading and generally chilling, finding a quiet spot away from the, as expected, hordes of visitors who’d also thought it would be a nice day to visit. We found the stone we had the photoshoot at previously and, true to his word, Barry came up trumps with a fine spread including champers. Now, had we not have had to walk round Ogbourne it would have been about 10 miles but in reality it was closer to twelve. This actually cheered Jane up as it explained why she felt so knackered. Roxy collapsed, Polly, on the other hand, was ready to carry on to Lyme Regis. 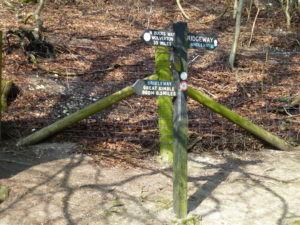 So, Wessex Way, South Downs Way or Walk to Wolverton next? Then again, we could have another crack at The Plough. https://www.greyhoundtring.co.uk/ Just off the Ridgeway but a friendly and dog friendly pub. Does get busy especially the grub which is excellent. Beer was very good too. Think they had Adnams and Tring Brewery on.